Legal citation of published decisions of the Supreme Court of Canada, Ottawa, Ontario (Canada). In 2000, the Supreme Court of Canada, based in Ottawa, Ontario, opted for a database and Internet-friendly neutral citation: S.C.C. It is often presented without the periods as "SCC". Since 2000, all cases chosen for release to the public are assigned a permanent SCC number with the four-digit year followed by the SCC and then a sequentially assigned number which starts at 1 given to the first judgment issued. 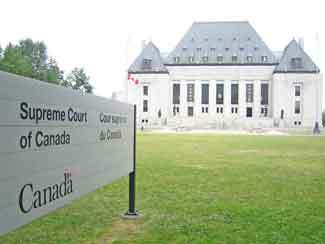 SCC is expected to eventually replace the older S.C.R. legal citation, the latter now only used in reference to the printed version of a SCC case.